CARL FRAMPTON HAS ridiculed the suggestion from Josh Warrington that he might look for an early night when the pair clash with the IBF world featherweight title at stake on December 22 at the Manchester Arena. Champion Warrington confessed that his only slight regret from his dismantling of then title holder Lee Selby at Elland Road in May was that he did not capitalise and attempt to force a stoppage when he had the Welshman tiring and cornered. He vowed to avoid a repeat in his BT Box Office blockbuster against two-weight world champion Frampton and, if the opportunity presents itself, he intends to go for the jugular. “I don’t like making predictions and I see a Josh Warrington win, but I am going to go for a stoppage this time,” stated the Leeds Warrior last week. If I see it I am going to go for it. Frampton, for his part, was unimpressed with the thinking of his opponent and mocked the 27-year-old by posting his Boxrec page on Twitter, circling his record which shows six stoppages from his 27 unbeaten contests. “He may take the pillows off then,” added the Belfast hero in a caustic follow-up comment. 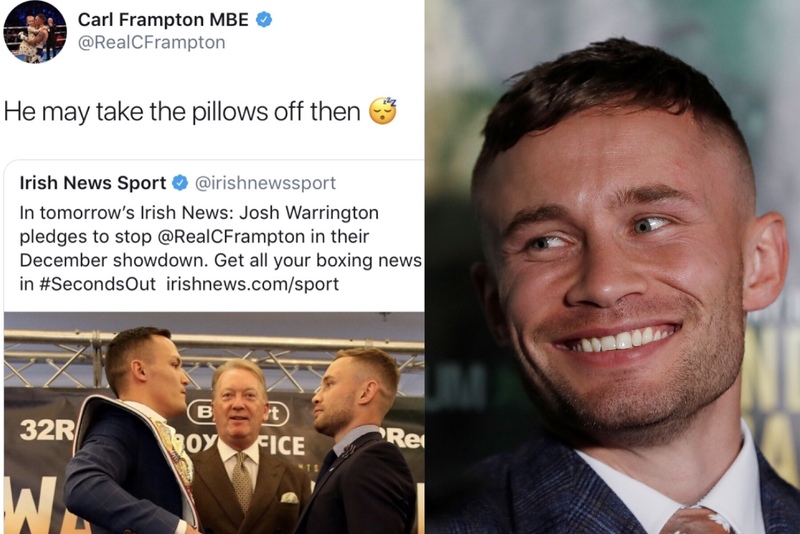 Friendly fire aside, Frampton did agree in response to another poster that all eventualities are being catered for and he was ‘preparing for a hard fight’. Warrington’s punch power has been questioned in the past, but he has answered critics in recent fights with impressive stoppages over both Patrick Hyland and Dennis Ceylan, with Hyland having previously only been stopped by Gary Russell jr and handing the experience to the Dane for the first time in his career.